How much more efficient? Well, according to the Department of Energy (DOE), an ENERGY STAR®-rated tankless water heater can improve efficiency by up to 34 percent compared to a traditional water heater. That’s a big deal when you consider that heating water can account to up to 20 percent of your total home energy cost. 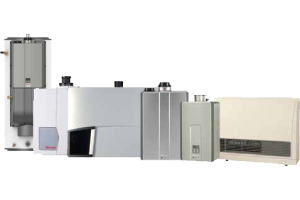 With that kind of savings, a tankless propane system could pay for itself in just a few years while delivering a host of other great benefits to your Connecticut home, including unlimited hot water, greater placement flexibility, and longer equipment life. In fact, about the only thing that makes people hesitate to make the switch to a propane tankless water heater is the up-front cost, since it is typically higher than a storage water heater. But now, thanks to the people at Rinnai – THE industry leaders in propane-fired tankless technology – that up-front cost may be less than you think. But that’s not the only way you can save: if you choose to have our pros install a Rinnai RL75iP Series water heater, you can also get a FREE year of maintenance – a $188 dollar value. Or you could sign up for a Hocon Installation and Supply Agreement and save $200 on your new RL75iP! Save today on a Rinnai tankless water heater, expertly installed by Hocon. Contact us today for a FREE, no obligation water heater estimate for your Connecticut home.